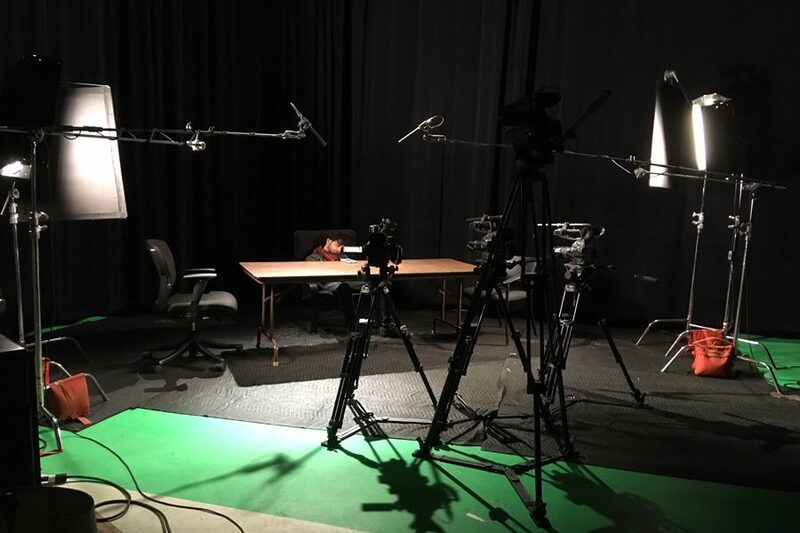 The set for a scene in “Problematic Puppies.” The film explores how obsession with dogs is impeding human connections. It’s an age-old saying: A dog is man’s best friend. But what happens when these beloved interspecies relationships get in the way of genuine human connections? Communication junior David Gordon attempts to answer this question in his film “Problematic Puppies.” The experimental documentary aims to show how certain people have taken an obsession with dogs to an unhealthy level, detracting from their relationships with those around them. Gordon said he thought of the topic after being assigned to create a film for his Documentary Production class. After brainstorming ideas in his apartment, the title “Problematic Puppies” popped into his head. After thinking through it, he realized it would make for an interesting subject. Kris Fleming (Communication ’17) said he came on board as Gordon’s producer because the two had been classmates in a horror screenwriting class. Fleming thought the film idea was “a really funny concept” that would spark an interesting conversation. Gordon said “almost everyone he knows” is involved in the film in some way. He called on friends to tell stories about their experiences, perform improv activities centered around dogs and even contribute Snapchat stories that will be used in the opening dog montage in the documentary. Gordon said the project is “experimental” in nature because, though it utilizes documentary techniques, it would not be considered a traditional documentary. The film will showcase footage from interviews with real people describing their experiences with dogs, contrasted with scenes by actors that provide the narrative backbone of the film. Communication junior Bill Pahutski, an actor in the film, said the film’s creative process was heavily centered around improv. Drawing from interviews of friends and stories on the Internet, Gordon would relay different scenarios and characters that served as the basis for the actors’ performances. Pahutski said the set was “a lot of fun” and described Gordon as a “very encouraging and supportive” director. “Occasionally you could tell we didn’t quite do exactly what he had thought was going on with the scene, but he was very good with adapting where the scene would go from the choices that we made,” Pahutski said. The main storyline follows the fictional story of a couple’s breakup after the boyfriend becomes obsessed with his new dog. In addition to interviews with both members of the couple, the film also weaves together the real-life interviews with dog lovers and haters, reenactments of stories from interviewees and mock interviews with actors, Gordon said. The documentary will run about 20 minutes, and Gordon said he hopes to have a rough cut finalized by the end of the quarter. Eventually, he said, he hopes to submit the film to different festivals and get it distributed to as far a reach as possible.